We are often asked by therapists and clients alike how to get rid of dark circles and puffy eyes. It’s a very common problem for many people, but also renowned for being difficult to treat. Clients will have often tried numerous anti-ageing eye creams that make all kinds of promises, only to fail in their delivery. The only option left is usually to conceal the dark circles and puffy eyes, however this can often look cakey and even draw more attention to them. To understand how to get rid of dark circles and puffy eyes we must first understand what causes them. As with all successful skin treatments, the product is only half of the solution. The knowledge and expertise behind skin physiology, enabling us to apply ingredients and treatments effectively, is the key to a successful result. The eye area is generally the first area of the face to show signs of ageing. This is due to the fact the skin here is much thinner, being around 0.5mm compared to 1.5-2mm on the other areas of your face and body. Due to the thinness of the dermal matrix in this area, it means that the skin is that much more vulnerable from free radical damage. This results in lines & wrinkles appearing first. However this also means the eye area is vulnerable to other concerns such as dark circles and puffiness. This is because these are vascular issues. The dermal matrix provides protection for the capillary network, so a loss in collagen and hyaluronic acid, means less protection for capillaries. The area is also prone to dryness due to a lack of sebaceous glands in this area. Also slackened skin being among the issues that the delicate eye area is prone to. Whilst lines & wrinkles are the number one concern, they’re also the most understood and therefore most easily treated. 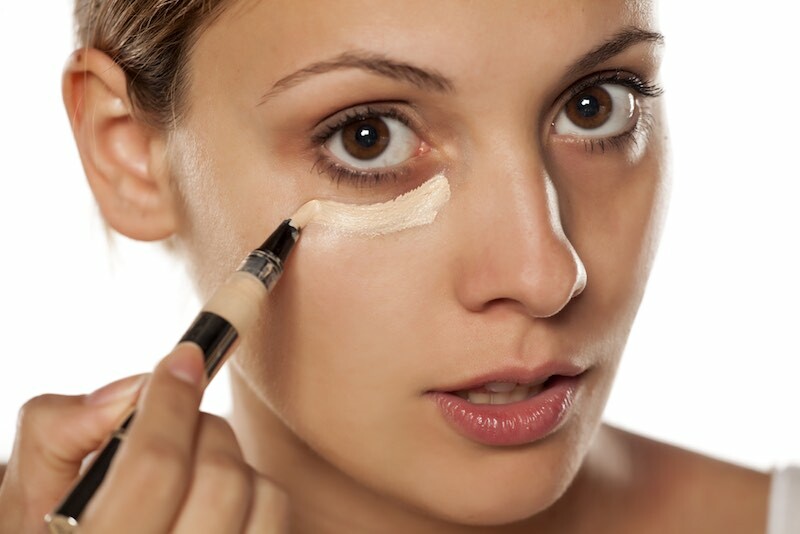 However, in this article we’re going to focus on how to get rid of dark circles and puffy eyes. As these are the least understood and most difficult to treat. What causes dark circles and puffy eyes? There are a number of causes of dark circles and the first thing in establishing the cause is determining the colour of the dark circles (i.e. purple / blue or brown). Also whether they’re permanent or temporary (i.e. do you have them all the time or do they come and go?). If the dark circles are blue / purple in colour and temporary, then you may simply be over tired. Lack of sleep affects circulation and oxygen supply, which means that the skin is not getting the oxygen and nutrients it needs. Due to the thinness of tissue, the issue is more visible around the eye area. However the good thing is, these are generally temporary and improve with a few good nights sleep. If the dark circles are blue / purple in colour and there permanently, then it could be a sign of vascular damage. Weaken blood capillaries allow blood cells to leach in to the surrounding tissue. This results in a blue / purple appearance in the skin, similar to a bruise, because essentially that what is! Haemoglobin leaks close to the skin surface, which degrades into Biliverdin and Bilirubin. This gives the purple darkness to the skin. However unlike a bruise that heals over time, the weakened capillaries continue to leak Haemoglogin resulting in a constant bruise-like appearance to the skin. There are a number of factors that may lead to this including ageing, illness / medication, stress, poor diet, UV exposure or smoking, ultimately leading to free radical damage attacking the capillary cell wall. If the dark circles are more brown in colour, which will also be permeant (as opposed to fluctuating), then excess pigment may be the cause. Melanocyte overexpression, where excess pigment is produced around the eye area. This results in brown dark circles i.e. 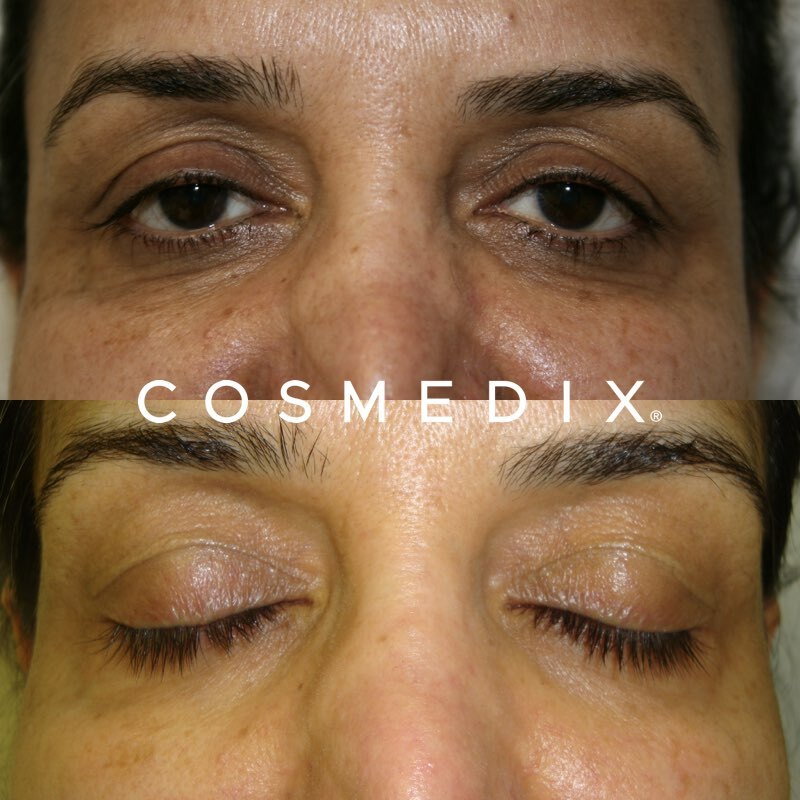 hyperpigmentation around the eye area. This is exasperated by how thin the tissue is in this area making it more prominent. It is generally a genetic predisposition and often common in Indian and Black skins. Localised inflammation may also be factor. Irritation from allergies and sensitivity, even inadequate makeup removal, can result in rubbing and pulling of the delicate tissue. In darker Fitzpatrick skin types where melanocyte activity is high the skin responds by producing more pigment. Remember melanin is our skins form of protection and is produced in response to UV exposure and / or the inflammatory cascade. Similarly to dark circles, under eye bags / puffiness is also vascular damage. However it’s the lymphatic capillaries that are damaged rather than the blood capillaries. Puffy eyes are caused by lymph fluid leaking from the capillaries into the surrounding tissue to form under eye bags. Similar to dark circles, tiredness also plays a role in puffy eyes because lack of sleep affects circulation and lymph becomes stagnant. A few good nights sleep and the condition generally improves. If the condition is more chronic than allergies and sinus problems could be the cause. Localised inflammation and free radical damage cause temporary swelling and eye bags become more prominent. Equally irregular fat deposits can also be a cause of eye bags. This may be genetic, so looking to your parents and grandparents will be a good indicator. Now we understand that vascular damage is the leading cause of both dark circles and puffy eyes. Now let us look at what causes vascular damage. Also what we can do to prevent it and what we can do to treat it. Natural ageing – as we age the skin naturally becomes thinner and weaker. The thinner the dermal matrix the more vulnerable the capillaries are and prone to damage. UV damage – UV exposure increases free radical damage and disrupts cell regeneration and therefore weakens capillary walls leading to leakage. Physical damage – tugging and pulling at the skin can weaken the capillaries. The tissue around the eye is very delicate, therefore must be treated with care. Ensure you choose a suitable cleanser for the eye area that can dissolve eye makeup without irritating the eyes. Poor diet – Without adequate nutrients the body is unable to repair itself, therefore the capillary walls will be become weak and prone to leakage. Dehydration – A blood and lymphatic system that is lacking in water can lead to stagnation and slow moving fluid. Allergies and sinus problems – Localised inflammation that causes cellular destruction and physical damage, from rubbing the eyes. Stress – Chronic stress leads to a rise in free radical activity which can cause blood and lymph capillaries to weaken. So how to get rid of dark circles and puffy eyes? When the cause is vascular damage we must firstly educate clients on the importance of prevention. Using antioxidants and sunscreens to prevent free radical damage. Alongside gentle cleansing and avoiding irritation around the delicate eye area. Perfluorocarbons – Improves circulation and oxygen delivery. Peptides – Support production of collagen to strengthen the skin. Antioxidants – Protect from free radical damage & reinforce barrier function. Retinoids – Thickens the skin making it more resilient. Liquid Crystal – Fortify the skin barrier function and replenish the cellular matrix. Helping to retain moisture in the deeper layers and make the skin more resilient. Eye care products such as CosMedix Eye Genius and CosMedix Opti Crystal contain a blend of these ingredients and can be used in combination to get rid of dark circles, reduce puffiness and also treat lines and wrinkles at the same time. We also recommend the Benefit Peel which is an acid-free treatment suitable for all skin types and safe for use around the eyes. In fact you can take it very close up to the last line to help address dark circles. The Benefit Peel is Vitamin A and Vitamin C based, so helps to boost collagen production, thickening the skin and also brighten areas of pigmentation. If you’d like to learn more about treating dark circles or puffy eyes get in touch on 0844 855 2499 or email [email protected] Alternatively if you’re looking for a Medico Beauty Institute certified practitioner to help address your pigmentation concerns take a look at our clinic locator.